Leah describes her grandparents as, ‘hoarders, never keen to throw anything away’, and so it was no surprise that their house was full of hidden treasures. A smile spreads across Leah’s flushed cheeks, as she says, ‘ I couldn’t bare to get rid of anything’. 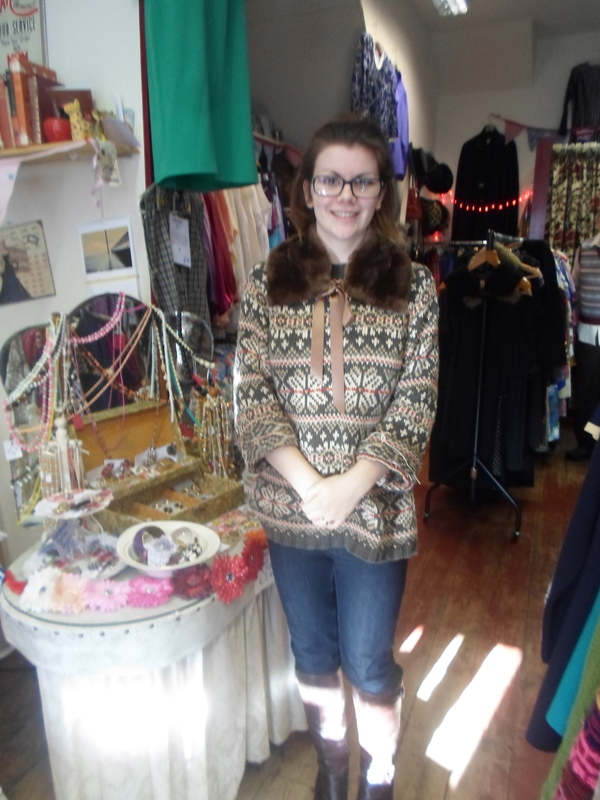 This sparked an idea for Leah – to open up her own shop, using her grandparent’s items as her first range of stock. ‘I had always adored vintage clothing, each piece feels like it could tell a story’. Vintage Per Sempre is bursting at the seams with items to cherish. Leah says ‘the 1950s dresses are my favorite items at the moment as they’re so delicate and carefully made.’ Leah is clearly in her element, smoothing down each of these garments, which ooze sparkle and elegance. With a permanent smile she assists a gentleman with his 1940s waistcoat, fixing his button she suggests other items that may complete the outfit. Leah says that since she was sixteen she was working two jobs, a sales assistant at Next and as a part time waitress, showing her high level of determination and work ethic. This also provided the money for her deposit to start renting the building. Since then Leah says that the business ‘pretty much runs itself.’ Profits made each month pay the rent. Falling pregnant with her daughter ‘Scarlett Rose’ when she was just eighteen and deciding to get married to her, now, Husband ‘Tom’ reveals that Leah had more than just the responsibility of running the shop. Leah explains ‘I doubt its most other eighteen year olds life plan but I felt ready, I wouldn’t want my life any other way’. It seems Leah has managed to squeeze so much into her years already – having achieved many ambitions of both motherhood and opening up her own vintage clothing store. . Leah says, ‘I love the freedom and flexibility of my job as I can get the work and play balance that fits in with my daughter’. Leah’s determination is remarkable and she says that if other eighteen year olds are given the same opportunities they should ‘go for it… people are so scared of failing and they shouldn’t be.’ Leah is a prime example of how age does not always determine your success and if you are motivated enough the possibilities are endless. Need an outfit for perhaps a themed night out? Or for those of you who appreciate the chic image of the 50’s or wish to indulge in the rainbow of colours from the 80’s, Vintage Per Sempre is the perfect place.